Being the middle child in a family is a tricky position to be in. You have older and younger brothers and sisters to contend with, and can feel not quite grown up enough to be with the ‘big’ ones but maybe too old to spend time with the ‘babies’ in the family. This is when effective and positive parenting really comes into its own as you have to find a way to ensure that the middle child in your family know they are as important and loved as their siblings. Middle children were once the baby of the family, and it is easy to forget this once baby number three comes on the scene. Whilst your first born will by now be quite grown up and probably quite comfortable with their place in the family, your second child might still feel like the baby. It may come as a great shock to them, therefore, when a new little bundle of joy comes into their lives, and they may find that they really don’t know where they fit in. They are both a younger sibling and an older sibling at the same time, and this can be confusing. By adapting your parenting skills, you can find a way through anything that family life throws at you, but it is important to recognise that things are changing and you will have to acknowledge the fact that your middle child may feel a little lost. Your oldest child will be very used to their role, and the addition of a new baby may not impact too heavily on them in terms of their behaviour and the way they treat their siblings. 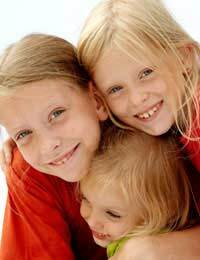 The middle child however is bound to be affected because being a bigger brother or sister is a new experience for them and something that requires adjustment. You may find that your middle child feels a little lost and unsure of how they feel about things. This is the time when you need to think about how you can manage this situation, and it could be by doing something as simple as arranging a special treat for your middle child, or spending time playing with them and chatting to them about your changing family. You may find that your middle child responds very positively to a change in circumstances, and that the arrival of a new baby brother or sister really brings out the best in them. Change Can Be A Good Thing....It’s Not Always Something To Worry About! As parents we often worry and fret too much about change within our families, and it is important to remember and acknowledge that quite often, children are well known for being far more adaptable and flexible to change than adults, and your middle child may well embrace the addition of a new baby and suddenly show their true colours as a very capable and caring sibling who is no longer a baby. Children are quite remarkable, and it is a good idea to sit back and watch what happens for a while when things change for your middle child, rather than rushing in with a ten point plan and a management strategy! It could be that actually you find it harder to adjust to change than your middle child does, and that they could really surprise you with their resilience. Take stock of a new situation first before you dive in, because you may well end up making a drama out of nothing.